Danger, betrayal, unknown lands, secrets, pirates – you’ll find all these and more in the wonderful adventure series The Mapmaker Chronicles. In the second book, Prisoner of the Black Hawk, Quinn is far from home as he continues in his role as mapmaker on the Libertas. Captain Zain and the Libertas crew are attempting to win the favour of the King by succeeding in the challenge to return to Verdania within a year with an accurate map of the surrounding countries and oceans. Quinn and the crew of the Libertas aren’t the only ones competing and not everyone is willing to trust that they will win based on the skill of their mapmaker alone. The dangerous animals in the new lands they discover can’t compare the dangerous schemes of the captains of the Black Hawk and Wandering Spirit and the easiest way for them to remove the competition is to make sure that the Libertas no longer has a mapmaker. Prisoner of the Black Hawk continues the story that began in The Race to the End of the World. The story is filled with a wonderful sense of old-fashioned adventure with sword fights, narrow escapes, daring plans, betrayed trust and the exciting discovery of new people, ideas, animals and places. 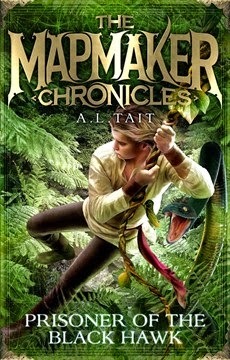 The work of Australian author A L Tait, The Mapmaker Chronicles is a fantastic series for readers who love stories filled with adventure and suspense. The story has a slight edge of danger that is just enough to thrill the reader and keep pages turning. There is one final book still to be published in this series. Readers are offered enough hints to be sure that there is still trouble brewing between the three vessels as they race to return to Verdania with their completed maps and there is still the possibility of a traitor amongst the crew of the Libertas. I can’t wait to see what happens next. You can visit The Mapmaker Chronicles website for more information about the books as well as teachers' notes and other resources.